BOSTON -- Mike Masse held the trophy proudly for nearly 15 minutes. Cooper DeVeau ran around in celebration. Michael Berluti threw his hands in the air in celebratory relief. For Xaverian, this Thanksgiving matchup had plenty of meaning. 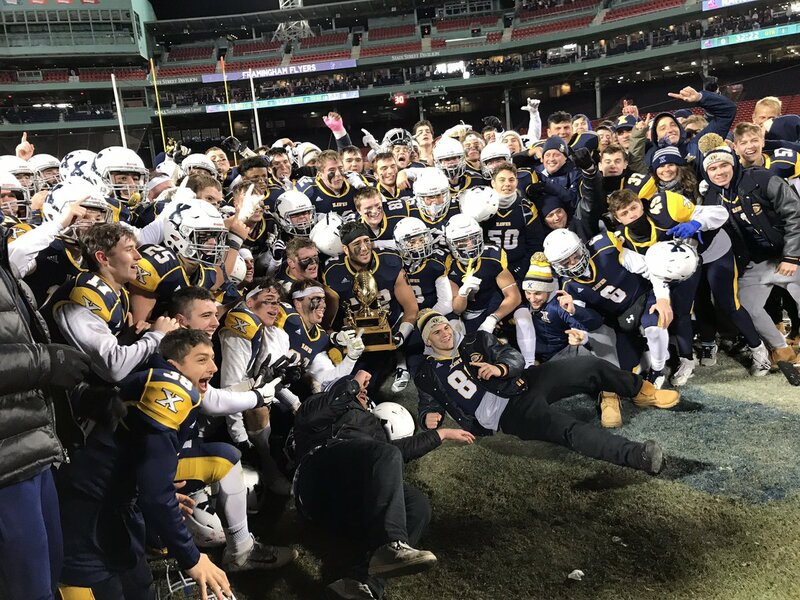 Berluti and Masse each rushed for touchdowns, while the Hawk's defense came through with a key stop late as Xaverian won its fifth Catholic Conference title in six years with a 14-12 win over St. John's Prep on Wednesday night at Fenway Park. "We are Catholic Conference champs. Give me something better," said Xaverian coach Al Fornaro. "Some people in the state think Thanksgiving games don't matter. Well you tell me, did that matter to people on the sidelines? The people who say that don't know the first thing about football." The Hawks may not be returning to Gillette for a sixth consecutive season, but the night was a 44-minute sequence of what has made Xaverian so consistently successful over the last half decade. Senior captain Cooper DeVeau was a member of a pair of those trips to Gillette, and then on Wednesday night experienced his second league title. "We wanted to bounce back. Losing to CM was tough," said DeVeau. "We knew we could win a Catholic Conference championship, it's not a state championship, but its a great way to go out as a senior." St. John's Prep will take on Catholic Memorial for the Div. 1 State Title next Saturday night. Trailing 14-12 with just over eight minutes remaining, the Eagles had a chance to go down the field and win the game. Beginning on their own 10-yard the line the Prep went on a 14-play drive highlighted by three completions from Matt Crowley to Wes Rockett (nine catches, 93 yards) to move inside the Xaverian 30-yard line. On fourth and four, however, sophomore Luke Thorbahn knocked down Crowley's pass forcing a turnover on downs with just over two minutes remaining. The Eagles looked as though they would get one last chance, but on third and 15 Berluti completed a 15-yard screen pass to DeVeau that kept the clock winding. Masse iced the game moments later plowing forward for seven yards on third and short to allow the Hawks to kneel out the victory. "This was bigger than the Super Bowl for us," said St. John's Prep coach Brian St. Pierre. "We have to get over it. We made too many mistakes. This is one of the most frustrating games I've ever coached." Xaverian grabbed a 14-0 lead in the first half with Berluti getting the Hawks on the board late in the first quarter. The sophomore quarterback faked the option pass and ran into the end zone untouched from 10 yards out to give Xaverian a 7-0 lead. Defensively, meanwhile, Xaverian gave the Prep fits for most of the opening half. Lucas Ferraro had a pair of sacks and a tackle for a loss, while JoJo Marinella and Mike Gordon both had fumble recoveries. The Hawks added to their lead midway through the second quarter. Berluti completed three consecutive passes for a combined 37 yards to get the Hawks inside the 10-yard line. One play later, Masse trucked in for an eight-yard touchdown run to put Xaverian on top, 14-0. Rockett brought the Eagles to life late in the first half. The senior two-way standout intercepted a Berluti pass to halt a potential Hawks scoring drive. Then, with less than two minutes to play, Rockett fielded a punt, received a block from James Hanley and took off for a 45 yard touchdown return to pull the Prep within 14-6 going into the locker room. "Being Catholic Conference champions is the greatest feeling in the world. This meant a lot to us," said Ferraro. "This is one of the greatest venues to play at in any sport.